This specialized formula contains 95% biodegradable ingredients with no Parabens, no gluten and tested for effective use on sensitive scalps. Enriched with Aloe Vera, and Coconut oils, it gently cleanses, leaving your hair healthy, shiny and beautiful. 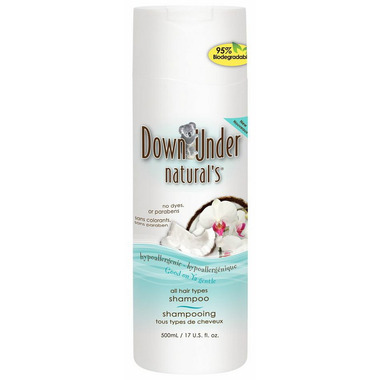 This shampoo is gentle, lathers up beautifully and has a nice subtle fragrance. My hair agrees with this product. I honestly wasn't expecting much from this product when I bought it, we simply needed something natural and biodegradable, so that it would. E more health-conscious for showering outside at the cabin. I was pleasantly surprised! Despite showering with lake water, this, along with the conditioner, left my hair soft, and almost silky, without needing to fight with tangles when I was done. Bonus: it has a subtle scent, so it smells fresh and kind of nutty, and your hair stays "feeling clean". Love this product. It works great. Will be a regular buyer of this product.